This retail location is seen in 1897 when it was the offices of the British Columbia Electric Railway Co. That was the year the company took over existing streetcar and interurban lines in southwestern British Columbia in 1897, and operated the electric railway systems in the region until the last interurban service was discontinued in 1958. It was created from the bankrupt Consolidated Railway and Light Company (forced into receivership due to a streetcar accident in Victoria). That company had been created from ten earlier companies – three of them also bankrupt and founded in 1890 and 1891. The Electric Railway Co were tenants in a building that had been constructed nine years earlier, designed by N S Hoffar for Dr. Whetham – we saw the building in an earlier image. Major Matthews identified the men as: Mr. Stein, Mr. McDonald, Mr. Jackson and Mr. Wilcock. There are three McDonalds working for the BCER – Mr McDonald is either HA McDonald who was a lineman, William McDonald who was the lamp inspector for the Electric Railway Co, or possibly Angus McDonald, the line foreman for the railway. Mr E H Willcock was a clerk for the railway company that year, although he would be a motorman in a couple of years. We’re not sure if the identification of the other gentlemen was inaccurate, if the street directory failed to identify them, or whether they were connected in some other way with BCER (or just keen to be photographed). As far as we can tell, there were no BCER employees called Stein (although there was an accountant with an office on the 600 block of Hastings nearby). Similarly we haven’t found anyone called Jackson at BCER, but there were two businessmen on this block of Cordova, one a jeweler and the other the co-owner of the Savoy Hotel, a couple of doors to the east. The almost windowless building that replaced Whetham’s was the first of only two buildings completed for Project 200, a massive redevelopment plan that would have seen the entire waterfront of Gastown bulldozed to create a row of towers over a waterfront freeway. This rather more modest structure was built in 1969 as the home of CNCP Telecommunications – the first serious hi-tech investment in the city, designed by Francis Donaldson and developed by Grosvenor Estates. The company was created as a joint venture between the CP and CN in 1967, merging the different networks used by the two railway companies. It became an early telecom business; was bought by Rogers in the 1980s, renamed Unitel and was later acquired by AT&T Canada. (It’s now called Allstream). Here’s an old house on Nelson Street. The picture probably dates to around 1917 when Walter Thicke jnr lived here – he stayed here until 1952. He was shown as a log tower (it’s an odd definition until we realized that Walter and his brother Claude operated a towing company and owned a tugboat – although in 1917 Claude was away on active service). Walter had got married in 1915 to Dorothy Higman, and we can tell that Walter was doing well from the announcement that “After the ceremony Mr. and Mrs. Thicke left for a two weeks’ cruise on the groom’s yacht, Adelphi.” Technically it wasn’t Walter’s yacht – it was designed by E. B. Schock for the Thicke brothers, built in 1912 and sailed by them until 1919 when it was sold to Bert Austin, who sold it in 1922 to Seattle. In 1916 Claude was working for a blue print company, and Walter was an accountant with the Hudson’s Bay Company. Walter senior was from England, having arrived in Canada in 1878 when he was around 31 years old. His wife, Clara, was nine years younger, and they had five children; Walter junior the eldest. All the children had been born in Ontario, and in 1891 the family were living in the town of Russell. When they first arrived in Vancouver they were living on Hornby Street in a house we already featured. The first time this house appears is in 1909, when Frank Barnett, who was in real estate, was the occupant. He seems not to have actually developed anything, and there’s no office listed either, so we’re unsure whether he developed it himself. In 1911 he was replaced by Hugh Sweeney, who ran two businesses, as H Sweeny & Co, Clothing, Hats and Caps and Men’s Furnishings, and in partnership as Sweeney & Needham, Exclusive Clothiers. Both businesses were on West Hastings. In 1913 Sheldon D Brooks of the Brooks-Scanlon Lumber Co owned the house, and carried out some unspecified repairs. In 1916 Allan C MacIntosh moved in here briefly, before the Thicke family, just in time for Walter’s daughter to be born in July. Claude Thicke was apparently the leading light of the towing company. Betty Keller recounts how he started in business on the Sunshine Coast towing with the 71 ft tug Coulti, launched in 1904 in False Creek for Union Steamships, but sold because it buned too much fuel. Claude bored holes in the firebox to improve combustion, and made a go of the business. When he returned from the war (where he was in the Navy) B W B Navigation was created with four tugs bought from the Progressive Steamship Company, used to tow log booms from Jervis inlet. The firm was renamed Blue Band Navigation when a new partner was added in 1923, and the firm added a sawmill and logging to the business – although the new partner was a poor businessman and the entire operation failed in 1931 while Claude was secretary and Walter manager of the company. In 1932 Walter was already a director of another company, Plummer-Craig, who were log brokers.In 1937 Claude also had a new job, working as the managing director of Hayes manufacturing, who built logging trucks on 2nd Avenue. That year Walter was identified as a salesman; in 1940 he was working as an appraiser by B C Appraisal, and both brothers kept the same line of business: Claude in 1950 was with Pacific Truck and Trailer, while Walter was treasurer and later a co-partner in the General Appraisal Company on Bute Street. The redevelopment of the West End saw the loss of many of the original houses, including this one. Zoltan Kiss designed Chelsea Square, a 3-storey rental building with a central courtyard in 1979. We visited the history of the development of the Desrosiers block in the previous post, but we didn’t look at who occupied it. It started life around 1900 as the home of M Magloire Desrosier’s stove business, which he passed on to his business partner Harry Slater in 1905. In 1908 there were two businesses – McLaren & Urquhart liquors, and Gustave Collasin, barber who was replaced a year later by a watchmaker, Earnest Lee. Upstairs that year was the Tien Tain restaurant, as it was until around 1913. In 1911 it was all change again downstairs – Schmehl & Wright sold liquors – presumably taking over McLaren & Urquhart’s business. They hired architect P J Donohoe to carry out $900 of repairs when they moved into the building bin 1911. (We came across Mr. Schmel’s earlier enterprise up the street in an earlier post). The business was still here in 1914, although they added cigars for sale as well as liquor. The restaurant upstairs was vacant that year, but a year later it reopened as the Sun Tien Tain. By 1917 the store was the Crown Liquor store, run by George Saunders, and the restaurant was once again closed. In 1918 it finally settled down to a longer run of occupation – Old Country Fish and Chips moved in, with the Chop Suey Restaurant taking over the upper floor. Herbert Love was running the restaurant downstairs, and he lived at 334 Carrall. By 1922, the year before our image was taken John S Johnston had taken over – perhaps that’s him, looking unhappy at having his picture taken. There was no restaurant upstairs – that was listed as Overseas Mechanics, which turns out to be the Overseas Mechanics Club, with David Kirkwood as secretary (despite a 1921 prosecution for selling liquor – one of a number of clubs prosecuted in the final year of prohibition). Mr Johnston ran the restaurant until 1930 when it was taken over by the Trans Canada Fish and Chips Co Ltd, although it was still called the Old Country. In 1934 it became the Rex Café run by G Megalos and A Nickas, and the upper floor was in use again in 1937 as Wand’s Photo Studio. By 1950 the café was still there – but it had become the New Rex Café, run by Dan George. In 1953 it became the Minerva Café, where John Mirras described himself as president and manager. 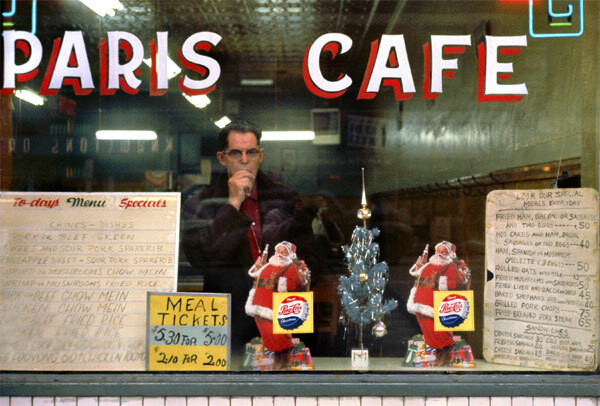 He didn’t last long, as in 1954 this became the Paris Café, managed by Wong Chun Foo, and photographed by Fred Herzog in 1959. Some of the items on the 1923 menu are still available in 1959, although the prices had risen a bit; fried ham, bacon or sausage with two eggs were 50c – in 1923 they were only 30c. Today the building has seen better days. The cornice is in a terminal state and a fire has damaged the building although the convenience store on the main floor is still open behind permanent shutters. You can’t get ham and eggs any more. Here’s the unit block of East Hastings Street. The building in the middle is the Pennsylvania Hotel (today), although it started life as the Woods Hotel, and in our image from about 25 years ago, it was the Rainbow Hotel. On the left is the Holden Block, today a residential building, but for a while the City Hall. The Desrosiers Block is the small building in the middle, identified in the Heritage Statement of Significance as being built by Michael Desrosiers in 1901. As with many of those statements, the details are not quite correct. He was really Magloire Desrosiers, and the building was constructed at least a year earlier. Magloire arrived in the city in 1888; In 1889 the first mention of him was as “Mich Desrosiers” – a foreman for McLennan & McFeely (gas fitters and cornice installers); a year later he was a cornice maker living on Pender with a workshop at 162 Water St. A year later there are two Desrosiers; John, a plumber and M, a foreman living on Trounce Alley. In 1892 Mike Desrosiers was a foreman tinsmith living on Richards. In 1894 he was still living there, but had his own business on Granville, tinning, plumbing and sheet metal work. The Daily World carried a profile of his new enterprise which he had initially set up in 1892. It lists some of the buildings he had created the cornices for including the Vancouver Club and the Vermilyea block. As well as having “all the latest improved machinery and machine tools known to the trade” he also specialized in installing hot air furnaces, mostly in houses. His business premises remained on Granville for a couple of years; then in 1897 M Desrosiers was listed as a galvanizing iron worker. He’d moved his business from Granville, was now working on Carrall and living on Helmcken. 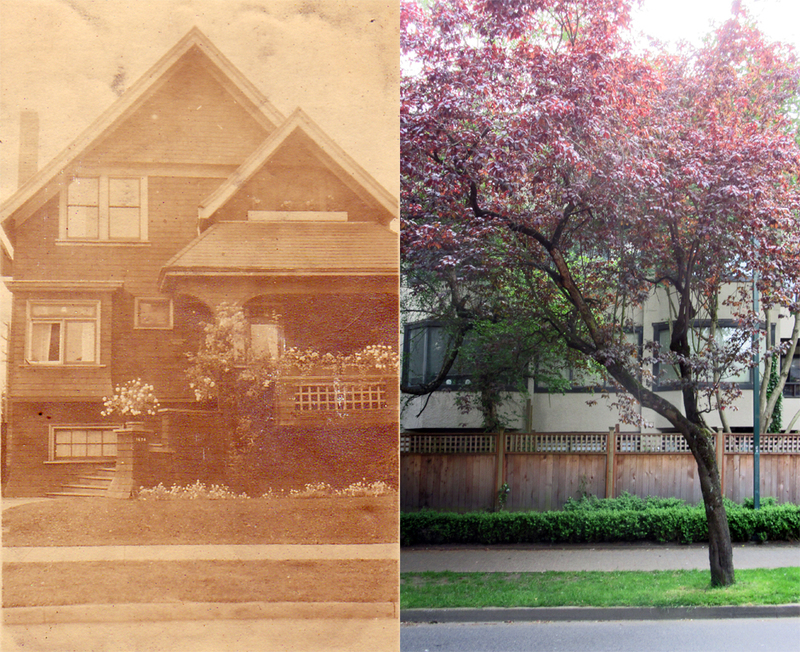 In 1899 there are two M Desrosiers listed – one, Michael is a plumber at 214 Carrall, living on Hastings at Heatley, and M Desrosiers a galvanizing iron worker also resident at 214 Carrall was living on Helmcken. We’re betting there was only really one – but he’d moved again, to this building, and had ended up with two entries. In 1901 he’s shown both living and working at 6 East Hastings, but the street directory also identifies McGuire Desrosiers, a tinner, as living at 528 Helmcken, so we think the family never really left their home on Helmcken at all, and the name ‘Magloire’ was heard, and recorded as, McGuire. The business remained in the new East Hastings store – from 1903 to 1904 he had a partner, H A Slater. The home address remained 526 (or 528) Helmcken, until 1904. 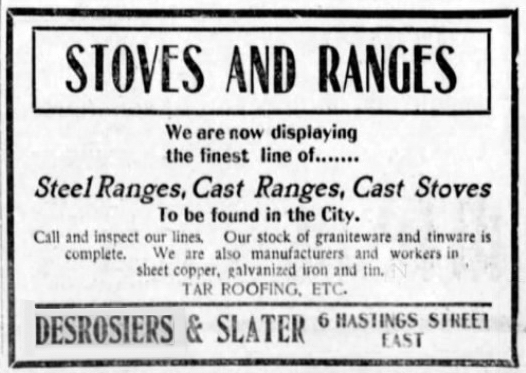 In 1905 the family moved to 1060 Granville Street, and in 1906 M. Desrosiers is no longer associated with the stove store, which continued to be run for a while by H A Slater. In 1908 the family moved again, to a house on Seymour Street, and Magloire is show as being retired (aged 45). Harry Slater (who was really called Henry) gave up the stove store and went on to being a sheet metal worker, with a works on Beatty Street and a home on Barclay Street (with his wife Fannie and son Melvin in 1911, along with their cook Wong Chang. The Slater’s were from Britain, and Melvin worked for his father as a tinsmith). We can track the Desrosiers family in 1911, although not without some difficulty as he’s recorded as M Des Rosser, living at 1063 Seymour. Now he’s shown (almost certainly inaccurately) as only being aged 40, his wife MG was born the same year, and his children are identified as AJ (son, 19), H (son, 15) MF (daughter, 12), WE (son, 11) MC (daughter, 8) MA (son, 7) and MC (daughter, 4). With a successful business career and seven children at home it’s not surprising that there’s a servant as well, 20-year-old M Simpson who had arrived from England the year before. Like the street directory, he’s also listed in the census as ‘retired’. We think he was probably older (as the 1901 census suggests) and he was probably the Magloire Desrosiers who was born in Joliette, Québec in 1862, and who was listed as a ‘voyageur’ in the 1881 census. After the war the family were still living on Seymour Street: there’s a Magloire Desrosiers in real estate with an office on Granville between 7th and 8th Avenues; (we aren’t certain, but this might be his son who was also called Magloire). A daughter, Cecilia lived at home, as did Florida, a stenographer and Wilfred who worked in Goodyear’s tire warehouse. In the early 1920s Magloire moved to W 13th Avenue, but Joseph O Desrosiers, a millwright, continued to live at 1063 Seymour Street. Marie, Magloire’s wife died in 1934, and he died in 1936. As far as we can tell they had nine children over more than 20 years – all the girls were Marie: Arthur Joseph in 1892, Marie Luce, Homer Joseph, Marie Florida, Wilfred Ferdinand, Marie Cecilia, Magloire Avila, Marie Eveline, and Clarence Pierre in 1914. Magloire’s obituary mentions his brother, ‘John’ was still living in Princeton. We don’t know who designed or built the block that M. Desrosiers developed. The Historic Statement says it was contractor P. J. Donahue – the problem is that Patrick J Donohoe (who was an architect in the US in 1901) was only briefly in the city in 1911 – so that seems unlikely. He was responsible for designing some repairs, costing $900, in the year he was in the city. Almost certainly M Desrosiers designed and built the cornice on his building, and no doubt he would be deeply unhappy to see how badly it has been maintained to the point that it’s probably beyond repair and would have to be rebuilt completely if the building is ever refurbished, rather than lost (which is a very real possibility). This contemporary building (when it was completed in 1974) represented a sign of success for Gastown. The picture was taken some time in the early 1980s; The entire block had been threatened with total annihilation only a few years earlier. Designed by Henriquez and Todd for Marathon Realty, it filled a hole in Water Street that would have seen this block developed as part of a wall of huge contemporary buildings for Project 200, the massive redevelopment that dated from the early 1960s. 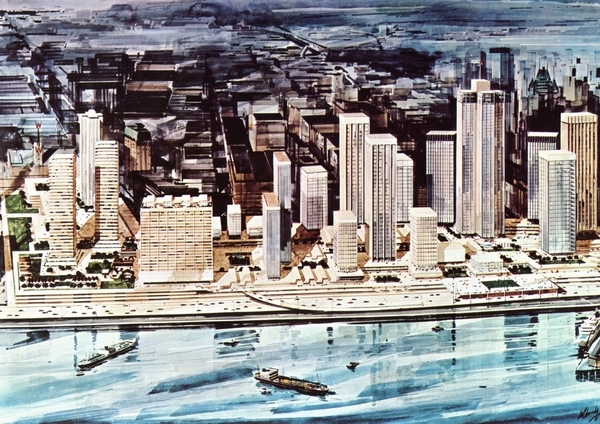 (Here’s how that project looked in the late 1960s brochures). Some of the buildings were to be apartments, there was a hotel, and obviously office space as well – including 200 Granville Street, the only tower actually built as part of the plan. 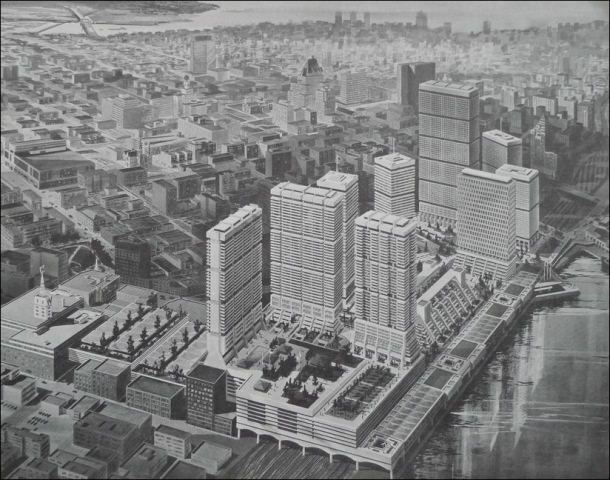 While much of the construction would have taken place on elevated decks over the rail tracks (and a waterfront freeway extension), the 100 block of Water Street would have gone as well. The development partnership started buying up land in anticipation of the project proceeding – which is why Marathon (one of the partners in the project) ended up owning this site. Project 200 was officially presented to City Council in 1966 (although it had been around longer, and was well known by councillors), and while some versions of history suggest it was the fierce opposition to the scale of the project, or the effect on Strathcona and Chinatown of the freeways that cut through those areas that sank it, really it was the exploding costs and a failure to agree on financing between the Federal and Provincial levels of government. Once momentum was lost, a change in party control in Vancouver to TEAM ensured it wouldn’t return. Marathon Realty, CP Rail’s development arm ended up with this site, and with no prospect of a mega-tower, commissioned a more scale-appropriate project, with a courtyard, office and retail. The design was a contemporary interpretation of the bay windows found down the street, with a warm brick finish to match the warehouses. The screen of the façade had a gravity-defying extension beyond the flank wall. The stairs that climb up inside the western end of the interior courtyard (on the left of the picture) were originally intended to be the entrance to a bridge that spanned the tracks to a new government-funded Fisherman’s Wharf style market on the waterfront. That idea was dropped when the even more radical Granville Island idea emerged, with Minister Ron Basford ensuring Federal funds (and control) to make it happen. That leaves a small coffee shop at the end of a flight of stairs with a great view over the rail tracks – if the freight cars aren’t blocking it. Here’s a view of Water Street before the 1970s Water Street parkade was built. The picture dates from 1970, and the only building still standing to the east of Cambie street is the Leckie Building – the big red brick warehouse at the end of the block. The building on the left hand side of the picture is the MacLean Building. We saw it in an earlier post, Built in 1912 for McLean Bros, and designed by Thomas Hooper. There’s a vacant site next door – and beyond that a modest warehouse that in 1970 was Cost + Imports. We think it started life as a $4,000 building built for Tomlinson & Cook in 1910, and supposedly designed by them as well. They also took out a building permit down the street for 50 Water Street (the 1906 Kane Block) a few years later. The strange thing is that there’s no sign of any entity called ‘Tomlinson & Cook’ in any street directory around this period. There were two people called Tomlinson who might have been involved in real estate in the city that year. James A Tomlinson was in partnership with J H McNab from 1901, running a flour and feed store. They obtained a permit to build a replacement foundation for their property in the 600 block of Westminster Avenue in 1910, and in 1911 he was also involved in the Pacific & Northern Unit Company, Limited, consisting of two portable sawmills, situated on the Skeena river. He lived on West 1st Avenue in 1911, having moved from Comox Street, where in earlier years he was listed as a merchant and a timber merchant. In 1911 he was aged 60, identified in the census as coming from Ontario. The more likely candidate is William Tomlinson, who lived on Hornby Street, and was secretary-treasurer with the Vancouver Brokerage Ltd, one of the city’s many real estate and financing agencies, with offices on East Hastings. Today all the building are part of the Water Street parkade developed in 1973, and redeveloped by the City of Vancouver in 2004, designed by Henriquez partners to fit into the warehouses still standing in the block. We saw this location in an earlier post when there were more substantial Water Street warehouses here. This is the building that replaced them as it appeared in 1973, and today. The Woodwards parkade stretches all the way from Cordova Street to Water Street, and was built as the Woodwards empire inexorably increased in size. The City of Vancouver acquired the 1957 parkade in 1995, and in the early 2000s spent $17m rebuilding the Cordova side of the structure, which previously had to be closed as the concrete was crumbling and the building structurally unsafe. The Water Street side was a later part of the parkade, designed by Paul Smith & Associates in 1971 (linked to the Project 200 plans), but was also rebuilt by the City of Vancouver at an additional $11m, with seismic upgrades, an extra floor of parking added and a ‘skin’ of office space to hide the parked cars (a significant improvement on the brick screen of the Woodwards structure). The renovation and reconstruction, designed by Henriquez Partners, includes retail at street level. When it opened there was a huge historically themed underground tourist attraction called Storyeum that quickly headed into bankrupcy. That space has now been re-purposed by the Vancouver Film School. Unusually for a parking garage, the new structure has won multiple accolades – the International Parking Institute gave it an award of excellence in 2005; the Stress Free parking website named it as one of the top 10 coolest parking garages in the world, and Popular Mechanics named it one of the world’s 18 strangest parking garages in 2012 (apparently because fragments of the old bridges from the Woodward’s Parkade were incorporated into the new building, and there’s a storm water recycling system built in). The justification for the City acquiring, renovating and retaining the parkades are to allow Gastown’s continued revitalization – not so much to provide visitor parking, but rather to permit ‘parking in lieu’ as revitalized heritage residential and commercial projects can develop with minimal or zero on-site parking. Some of the new Woodward’s parking is still included in the structure, linked by a new overhead walkway across Cordova Street.